Business Studies Journal (BSJ) offers an open access platform to discuss the latest research findings and developments in this field by publishing original research in this field. Affiliated to allied academy, this journal enjoys an acceptance rate of 25%. Business studies journal caters to a vast section of business professionals, policy makers, business school students, academicians, researchers and practicing marketing, finance, economics, business law and human resource development professionals by publishing exclusive case studies, research articles, reviews, analysis, commentaries and opinion articles following applied and qualitative research techniques in business and business issues. More information on the types of manuscripts published and the categories of research accepted are displayed in the journal matrix section of this website. Sponsored by the academy of business studies, the journal adheres to double blind peer review process to enhance quality and originality. 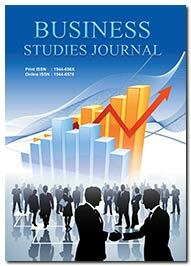 The journal thus covers a wide category of topics in this field including, but not limited to, customer relationship management, business conditions analysis, holistic management approaches critical thinking in the management of technology, international industrial development strategies, telecommunications in business, multinational business finance, capital budgeting, and business data management. Authors who would like to discuss the potential interest in a manuscript may contact the editorial staff .